The Beast Maker is Coming! Never say Neverworld or you might end up trapped there, subject to the mercy of the Beast Maker! Obsessed with crafting new, ever-more-monstrous creatures, this denizen of the Shadow Realm has run out of new resources to frankenstein together, so he's turned his attention to Lore! To save the day, you'll need the help of your favorite Goth Gypsy Pirate Musician, Voltaire, and his undead teddy bear, Deady. Take control of the Neverworld AND the adhorrible mutants the Beast Maker's left behind. If you don't, we're doomed without a shadow (realm) of a doubt! (Un)Lucky (and Creepy) Event Rares! The Beast Maker is a creature-crafter beyond compare, and he's got the creepiest gear imaginable lying around the Neverworld! Beware armor sets that go Bump In The Night! Battle through this shadowy land and pick up these epically unsettling armors, weapons, and other gear as souvenirs of the most gruesome Friday the 13th event yet! The Darkiphant is a nightmarish creation. Made from gorillaphants and unknown parts. We've got many more event rewards coming this Friday, so keep an eye on the Design Notes for extra-awesome sneak peeks tomorrow! Death Bunee Nitro Toys at HeroMart on Friday! Just when you thought the coast was clear… the Bunnypocalypse strikes again! And this time around, these adorably demented Death Bunees Glow in the Dark. It’s like real-life magic in the palm of your hand! Or in the box. Really depends on how safe you feel with a wild Death Bunee watching over you. In addition to a lifetime of creepy stares, your Bunee comes with a special code that unlocks a Death Bunny Nitro pet in AdventureQuest Worlds! Death Bunee Necro, Death Bunee Nitro, and Death Bunee Glizoryn! 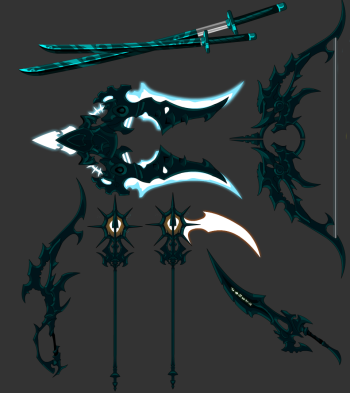 NEW items for the Dage vs Nulgath War! #DagesLegion won the first skirmish in the war to determine who is the greater Evil, and to reward his loyal minions, he's made MORE rewards to release this Friday! Check out these bad bows and beautiful blades! Never fear, #NulgathNation! Although Dage's Legion won the first skirmish of the war for the Underworld, all is not lost! You can still win this war, and we've got TWO war releases left for you to fight in! To provide you with incentive, Nulgath's shops will also get awesome new rewards fit for the followers of the Archfiend! Previews of those will come later this week! 23 hours left on Galanoth Helm Auction! Help a Bountyhunter out! 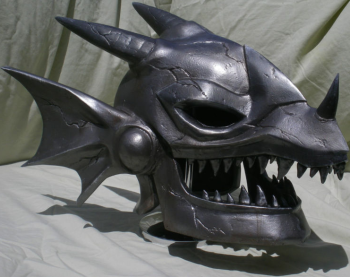 There are only 23 hours left for you to bid on this real-life rare version of Galanoth's Dragonslayer helm! Hand-made by J6 help him pay the bounty on his upcoming, intergalactically-epic wedding, there are only 3 of these helms in existence, and only ONE will be sold! It measures 21 inches long, 14 inches wide, and 12 inches tall (including horns). It will fit large-sized heads, so if you're as sturdy as Galanoth and looking to take up a blade and become a Dragonslayer, this is the helm to get! The winner of the auction will ALSO get the never-before-released Lair house in AQWorlds if they own a valid account!